No, the laptop I really wanted was a new MacBook Air, or even a redesigned 13-inch Retina MacBook Pro with a sleeker chassis. Although the latter arrived eventually, neither came quite in time for Apple’s early 2016 rounds. And like many other Air fans, I realised that another year was to pass by without one of the best Macs getting an upgrade. So I bought the next best thing. One year later after the first Retina MacBook, Apple has refreshed it with Intel's sixth-generation Skylake processors while introducing faster storage, memory and graphics for the same price. 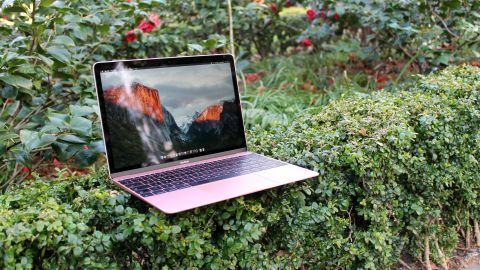 The most interesting change is on the outside: a new Rose Gold finish that genuinely makes me consider owning a shiny pink laptop for the first time. Gender stereotypes be damned. Now that the iPhone 8 and the iPhone X are both here in the flesh, the 12-inch MacBook is one of the remaining ways that you can take home an Apple product in a Rose Gold suit. But clearly, given the fact that overall Mac sales are up 10% this quarter at 5.4 million units, its glaring finish isn’t the only reason to purchase the 12-inch MacBook. In fact, if you were thinking about buying a Google Pixelbook instead due to its use of 7th-generation Intel Core i5 and i7 processors, surely you’ll be delighted to know that there’s a comparable MacBook model out there for you. The MacBook 2017 starts at $1,299/£1,249/AU$1,899, but for 300 more in any currency, you can get the same i5 Google uses in the Pixelbook, not to mention an i7 for 150 on top of that. However, if you’re happy with your existing MacBook or plan on buying a 2016 model in next couple of months or so, there are some improvements in tow for you as well. The latest version of the Mac operating system, macOS High Sierra 10.13.1, came out recently and decided to thwart the widespread ‘Krack’ WPA2 connectivity issue in addition to adding new emoji.